Alessi Michael Graves Bird Kettle (ALKETMG) at Pure Design / Accessories / Kitchen ::: Furniture for the Home, Office, Home Office, and More at Pure Design Online! Alessi's all-time bestselling product! 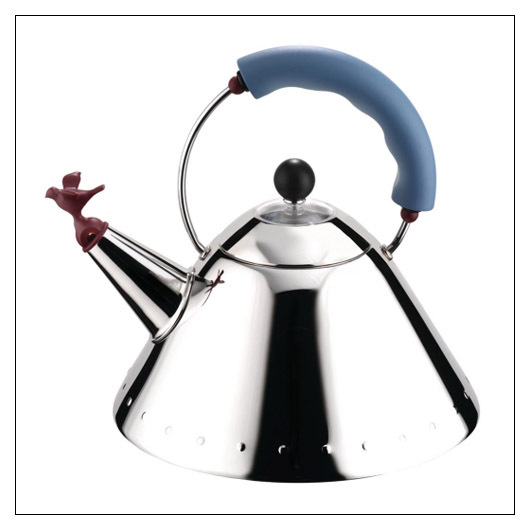 This Michael Graves kettle features a bird that sings when the water has boiled. When it was introduced in 1985, it was a great success, and still is. For Alessi it represented a meeting of great design and mass production methods, a combination that Michael Graves worked hard to achieve, applying his personal visual code which fused influences from Art Deco to Pop Art. Remove bird before pouring water. Use kettle on suitably sized gas rings or electric elements to avoid damage of finish. Suitable for all heat sources. Lower 48 US sales only.